An aerial view of a section of Kampala Capital City. Uganda has licensed 1,900 projects valued at $7.5b in planned investments in five years. According to data from Uganda Investment Authority (UIA), the country has attracted 1,900 projects against a target of 1,500 in different sectors of the economy since 2013. In the 2013/14 financial year, UIA licensed 461 projects worth $2b, which declined in 2014/15 to $1.4b from 327 projects. In 2015/16 UIA raised $1.5b from 353 projects, which soared to 512 in 2016 valued at $1.6b. With a standard target of 300 projects, UIA licensed an average of 350 projects apart from 2017. 2017 was recorded as the worst year for the investment sector where only 247 projects were licensed with planned investments worth $876m, a 47 per cent decline from 2016. According to UIA, the drop was attributed to a transition period of investors to the electronic business licencing system. "This decline was attributed to changes in the system of licensing after introduction of the e-Biz system of licensing of projects. Some investors lacked capacity and could not cope with the requirements of the system," Mr Lawrence Byensi, the UIA acting executive director, told Daily Monitor in an exclusive interview at the weekend. In 2018, a Malaysian investor announced a $70b investment in biogas fuels. However, to date, no progress has been registered. According to UIA, of the planned investments, 77 per cent are actualised, meaning 77 per cent of the $7.5b have set up developments in Uganda over the five years. The UIA data also indicate that foreign direct investments have topped domestic investments excluding 2015 and 2017. According to UIA data, China, India and Kenya were the main source countries for investors in the period under review. However, Middle East countries such as United Arab Emirates are increasingly showing interest in investing in Uganda. The Arabs, Mr Byensi said, are mainly interested in agriculture and tourism in Uganda. The data shows that investors have been banking their hope on the available political stability, affordable and available labour, land and favourable business environment. The manufacturing sector registered the biggest number of licenced projects (125), accounting for over 50 per cent of licensed projects in 2017/18. Agriculture, fishing, forestry and hunting contributed 14 per cent in the same period while finance, insurance, real estate and business services came next. However, mining and quarrying, electricity, gas and water and wholesale and retail, catering and accommodation services have consistently failed to attract a significant number of investors. Investors, the data indicates, preferably invest in the central and eastern more than northern and western regions. 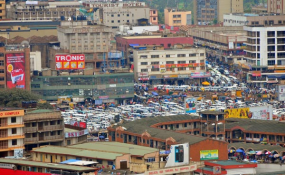 Kampala, Wakiso, Mukono top the preferred investment preference in central. UIA has a target to create one million jobs by 2020.